I debated at great length with myself as to whether or not I should write this particular post. I have lost sleep over it, in fact. But the truth remains, and if that is indeed what I am trying to covey– the Truth –to the best of my ability, then I cannot in good conscience discuss the perils and pitfalls of religion without having an honest discussion with you about The Man Upstairs. The Big Kahuna. The Holy Padre. I was raised in the Southern Baptist Church and baptized around the time I started grade school. It wasn’t until around the age of 11, however, that I was actually old enough to appreciate the rapt emotions and overwhelming experience of being “saved” at a Baptist Revival. I remember the moment of accepting Jesus into my heart. I remember the warmth in my body, the spiritual ecstasy, the support of my church family around me, the sense of purpose, the nervousness of walking alone down the long aisle to the alter, the feeling of being pulled there. I remember thinking, as the preacher laid his hand on my shoulder and spoke a muffled prayer through bad breath, that I had finally found the path to Truth and Light. A few months later, among sweaty throngs of adolescents like myself in a Church Camp Tabernacle in North Texas, I walked down another aisle and dedicated my life to Christ’s service. It all felt so right. I became an Atheist, at the age of twelve, less than a year later. Atheism is the absence of belief in a deity. I do not believe, based on the evidence (and lack thereof), that any deities exist. Atheism is NOT a religion. Religion seeks to explain and nurture the relationship between humans and a god or gods. Atheism is NOT based on faith. Faith is the belief in something with NO evidence or in spite of evidence. Atheism is NOT itself a claim; it is the rejection of the claim that god exists. Atheism is NOT a belief system; it is an answer to a single question, “Does God Exist?”. Some Theists (people who believe in at least one God) argue that if God exists, then He is beyond our natural world and therefore unknowable and untestable to science. I agree. If that is the case then we really can’t ever know for sure. That is why the idea is rejected by science. It is a hypothesis that can not be tested and cannot be proven with the current complete lack of empirical evidence. If the evidence changes, if God makes Himself universally known, science will happily revisit the question. Some believers challenge me to “prove that God doesn’t exist”. That’s impossible. You cannot “dis-prove” a claim like that. You can only reject it in light of insufficient evidence and offer alternative theories or hypotheses. I cannot “prove” that the Easter Bunny doesn’t exist unseen somewhere, but I do have an alternate theory involving sneaky parents. Interestingly enough, I don’t have to go around identifying myself as an “A-easterbunny-ist”, nor do I get looked down upon for not believing in Easter Bunnies, or the Tooth Fairy, or elves, or a Flying Spaghetti Monster (for the record I’m agnostic when it comes to Santa Claus). No, in fact, you and I and pretty much every single person on the planet are complete atheists when it comes to Zeus, or Apollo, or Poseidon, or Pan, or the Egyptian God Ra. I just take it one God further than most people. The thoughts and feelings that a Christian has when trying to comprehend how anyone could believe in the Hindu monkey god Hanuman, and his or her complete lack of concern over going to Hell for not believing in such a god are the EXACT same thoughts and feelings that Atheists have when trying to comprehend Christians and their faith. It is this faith that is so highly commended in religion that is so harmful to the world. Believing in something so much that you design your entire life around it, when that belief causes you to do harmful things in spite of a lack evidence or evidence to the contrary, is dangerous, unreasonable, and flies in the face of rational thought and the way most people deal with all other aspects of their lives. You don’t have “faith” in politicians, or the products that you buy, or your spouse, doctor, or even your preacher; you TRUST them based on a long-standing record of credibility and reliability. And a “leap of faith” is a poor replacement for an educated guess, which actually is a valuable thing. Believers often claim that the feelings they have about God are proof that He exists. I’m sorry, but that’s not how it works. I had those same feelings, which, I admit, are completely real and valid, but they are the result of the communal ritualistic experience itself, not a direct line with a deity. These very same experiences can even be induced in the laboratory by stimulating the temporal lobe or administering mind-altering drugs. I am told by the religious to look at the human eye as evidence of a Creator. The evolution of the human eye can be explained in 6 steps. And if we’re so special to God, why did He give eagles and cats much more powerful eyes, and for that matter, dogs and deer much more powerful ears? Creationists have a similar argument that claims that the Universe and the World are so suited to life, and to human life, that there must be a Creator. Then why is the Universe mostly empty space, with most of the areas where matter is collected being uninhabitable? Why is our tiny little planet such a harsh place of extremes, with many places being uninhabitable, and why is life here a ruthless, painful and constant struggle for survival? Why is the extinction of 99% of all the species that have ever lived before us on this planet part of God’s Plan? Why is the human body at times poorly designed, faulty, or useless if we are made in His image? But how did the Universe come to be if God didn’t create it? Well, if God exists, then who created God? And if God has always been around, then why couldn’t the Universe always have been around? (There IS a hypothesis about an infinity of Big Bangs and Big Crunches.) We don’t know exactly what’s happening on these huge scales of time and space, but we’re searching for the answers, if they can be found. We’re pretty sure it’s not Yahweh though. I am often asked why I attack the belief in God, when the idea helps so many people in their daily lives. Does it? The belief in a deity almost always involves a religion, and I believe I have addressed the downfalls and dangers of religion at great length already. For those of you who don’t really put much stock in the religion, the Bible, or even God for that matter, but you may go to church with your family because “it’s what good people do”, you are providing the safety umbrella that religious extremists can hide under. There are far better sources of moral teaching and community involvement. And for those of you who are Agnostic and riding the fence on the whole God issue, you are guilty of the same crime. Tolerance is an incredibly demeaning and condescending term, and all religions cannot coexist, regardless of how cute it’s written on your bumper. If you believe in God, then you believe in a being who does not answer the prayers of billions, who kills millions of innocent people in horrible ways in natural disasters on a so-called designed planet according to His plan. This is a being who aborts millions of babies naturally every year, who allows good people to die and bad people to live, and who watched with complete indifference as humans suffered in 25 year lifespans, most dying from starvation, disease or their teeth, for thousands of years before He revealed himself to us. And even then he failed to say anything that was of much use. If God is, in fact, real, I want absolutely nothing to do with Him. Prev: What Religion Gets Wrong: Morality Next: What Soul? ~ by christhehumanist on January 28, 2012.
oh boy …. so this is all just a treatise about changing some words for different words so that my words appear to be different than yours? We can change the word deity to atheist and the word atheist to humanist because … why …. it is more palatable for every day consumption? Does it sound better to the outside world …. atheist is after all frowned upon in much of society…especially in the mid-south and other post confederate states …. Belief…disbelief… two sides of a coin and “why” and “who” is a never-ending story. Maybe you could present as being less defensive in your choice of words if you would stop and realize that change comes from experience, not words. I learned that the only way one can … the hard way. I am not just trying to change words. Deity is not the same as atheist. If a person believes that they were created by a deity, and that a creator has an influence on their daily life and expects certain behaviors from them, that affects all of the decisions that person makes in his or her life. In some ways, it causes you to make better decisions. In some ways, it causes you to make worse decisions. I believe in making decisions based on the facts, not religions. The term atheist is typically meant to describe someone who does not believe in God. I’m sorry, but that does not represent the encompassing philosophy of my life, and does not come anywhere close to it. Now Humanism (with a capital “H” to signify secular humanism) DOES entail a belief system that involves using the better parts of our human nature to make a better world. That is why I suggested it in place of “atheism”, which only describes a small part of my belief system. It is NOT about winning favor with the public. Belief and disbelief cannot be “two sides of the same coin”, because EVERYONE has a belief system that they base their actions on in life, even if it is not well-developed. I am suggesting a more beneficial, well-developed and informed belief system than religion has offered. I am not in the business of making ANY word a “know all and end all conclusion”. As I have stated many, many, many, many times now, I am a scientist who relies on the best evidence. If there is a better word, by all means let’s use it. If my beliefs are proven wrong, I’ll reject them in light of a better system of belief, I have done this before with Christianity. But the word I use to describe my belief system is not a God. I’m baffled by your last paragraph. I agree that change comes from experience and not words. The Bible is full of words that people live their lives by. I am rejecting that in favor of evidence through experience. I will discuss this more in a later post, I promise. The dangers of having no belief system are as bad or worse than having a dangerous and flawed belief system. I am trying to replace both for the betterment of the world. I love the spaghetti monster at the end there. You bring up some interesting points, some I hadn’t yet pondered myself. I have been having lots of discussions lately about religion and belief with some of my elderly clients. One who takes great offense whenever I remind her that I am NOT a Christian and she tells me that I am such a good person so I MUST be Christian. I tell her that Christians don’t have a monopoly on “goodness” and that it’s very possible to be a good person without a belief in religion. I get so frustrated that I usually keep my opinions to myself unless someone begins spouting their religious beliefs to me- then I let my opinions flow! Thank you so much for taking the time to read and respond with a comment. 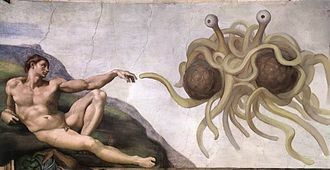 I’m glad you like the Spaghetti Monster! After all, He boiled for your sins. (If you click on the link I provided it goes into detail about why this deity was created as a teaching tool.) I think it’s awesome that you have the courage to have conversations about these types of things with religious believers. I hope some of what I have said will help you to formulate your arguments and make those discussions even more fruitful. As always, to anyone reading this, please keep those conversations respectful, cool-headed and well-supported by facts. I do NOT approve of the behavior of some Atheists who publicly try to cut down, humiliate or talk in a disrespectful way to Christians. We are all on the path of discovery together. Just for the record, Chris, I am agnostic, too, when it comes to Santa Claus! Great quote, Michelle. Thank you for sharing it. Thank you, Chris, for bravely and energetically posting your own journey in this blog series. Evolution does not only come as a species, but as an individual, too, on the path to Truth with a capital T and personal truth with a small t. We are all sojourners here together. This is by far your most touching post. The picture you paint of a young boy in trusting faith coming to God is a vivid image. Your description of your experience is a wonderful narrative and deserves elaboration. The abrupt and unexplained reversal into atheism at such a young age is stark and mysterious and cries out to be revealed. Your story is far more interesting than all the scientific expositions that follow in this particular post. And, the empty space inside the dichotomy between the young boy of faith and the renouncing, disbelieving young boy is where your current passion to convince others to disbelieve has its roots. The untold story is where the real story really lies. One of my favorite Star Trek episodes is one where Captain Picard and his crew of the Starship Enterprise encounter an alien culture whose language cannot be deciphered. The culture is the Tamarians. The computer’s universal communicator which can normally translate any language can only translate the words but not the meaning of what the Tamarians are trying to say. This is because the Tamarians only communicate with allegory. Instead of communicating in sentences, they utter phrases that are references to lore from their history and mythology. It would be as if instead of urging soldiers to be brave as they go forth into battle, they might say something like, “David and Goliath”. For the Tamarians, communicating was done through imagery and references to stories. I think it is hard to overemphasize the importance of mythology and stories as repositories of truth. When I use the word “mythology,” I don’t necessarily mean fanciful stories. Rather, myth is the spiritual substance inside a story. Myth is the truth that the story is trying to convey. And, for me, spiritual truth is as important as factual truth. Sometimes the two intersect, and sometimes they don’t. And, when they don’t intersect, they don’t necessarily contradict each other; they are simply speaking to two sides of the same reality. That reality is that, like you and the two little boys inside the young you, each of us is a schizophrenic division between our rational self and our spiritual self. But, together, the two are really one and make us whole. Stories are far more important to presenting the truth to us than all the facts in the universe. Facts inform the truth, but they don’t contain it. But, stories and more importantly the myth inside the story is where the truth truly and really is to be found. This is proven by our dreams. There are stories inside of us that we don’t know yet. Otherwise how could our subconscious mind surprise itself? For example, you are asleep, pleasantly dreaming about a world or place you’ve never been and with people you’ve never met. Suddenly, without warning, something shocking happens in your dream and you wake up in a cold sweat. So, now. How did your subconscious mind sneak up on itself like that? Didn’t you know the story you were about to tell yourself in your dream? No? So, why not and how can you not know your own story and be terrified by a story your own mind was telling you? That’s a bit spooky, don’t you think? To not know what your own mind is up to while you’re lying there in neutral! All this is to say that God speaks to us in the form of stories and narrative. And we get ourselves in trouble when we try to judge those stories by fact and science because they weren’t intended to be understood that way, but rather mythologically or poetically. It’s like the Tamarians. God speaks to us in images and story. That’s why it is not unusual for the Bible to say that God spoke to someone in a dream (Joseph, Daniel, Joseph the father of Jesus, Peter). For, you know as well as I that a solution to your own dilemma can sometimes be revealed to you in your sleep. More importantly when the truth comes to us in our sleep, it comes to us in the form of a story. For, dreams are our own personal stories, our personal allegories. And, like the Tamarians, our dreams are legends or myths that bring meaning from the inner reaches of our subconscious. So, if we can’t even know our own mind or be prepared for its stories, how can we possibly be so certain that we know the mind of God? Or how can we be so certain that the myths and stories that have been so prevalent throughout human history are not pointing us to the reality of the existence of God? We might be surprised! Thank you so much for your comment. I realized I hadn’t responded to it yet, so I’d like to take this opportunity to do so briefly. I wholeheartedly share your ideas about how important mythology, narrative and story telling are to our species. As far as communion and knowledge transfer goes, it is our ability to tell stories to each other that has created our very society. We couldn’t coexist without a shared narrative. Just look at how much of our everyday conversation with others revolves around us telling stories, and others responding with their stories. This ability literally binds us together. However, as you know, although I believe that shared story telling is essential for grasping and exploring truth, I do not believe that it comes from or is inspired by an actual deity. As for dreams and other strange thoughts, I will be exploring the inner workings of our minds in an upcoming blog post. And as for what happened when I was 12…..I began reading the Bible and asking questions. It was so apparent, even to my young mind, that the Bible is amazingly inaccurate in matters of scientific reality and unflinchingly contradictory in its very morals and stories. I remember sitting down with my Bible on Christmas Eve to read the story of Jesus’ birth in all four gospels. I remember the extreme disappointment upon realizing that none of them tell the same story, and on many crucial details they directly contradict one other. This was not the clear and flowing story that I had been presented with many times in church. How was this the word of God? I had been lied to. The church had broken my heart. This revelation caused me to explore more about Christianity, and in doing so, I realized that it was one of MANY world faiths. How had I reached the age of 12 and had not been told this by anyone? Then I realized that my denomination was one of MANY denominations, and they all disagreed about the very inconsistencies that I had found. At that point, I realized that every religion claimed that every other religion was wrong. Were we all going to Hell? How could I be sure that the religion that I was born into by chance was the correct one? 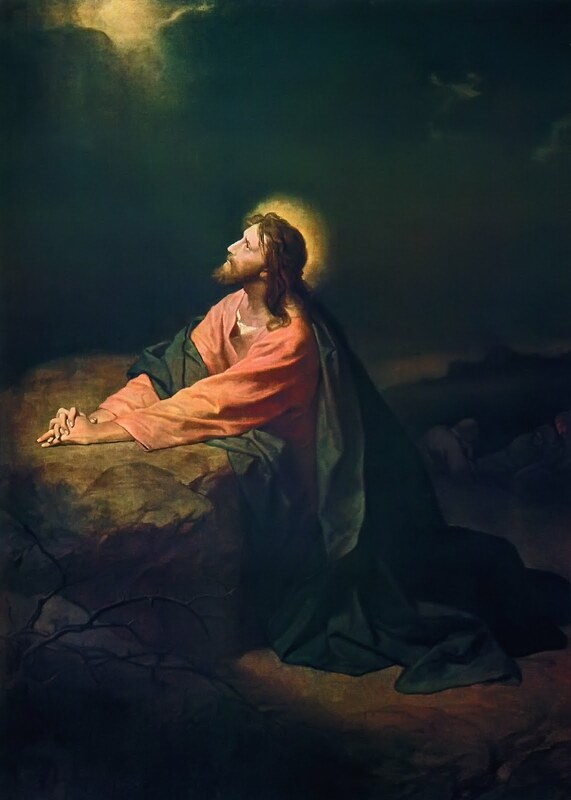 When I asked adults how God could answer everyone’s prayers, as Jesus guaranteed in the Bible, when many people’s prayers opposed each other, the most common answer was “I don’t know. It’s God’s will.” At that point, the veil was lifted and although I had never heard the term “atheist”, I knew there was no God, and I spent the next 2 decades trying to figure out what is really going on here and how to make my peace with that (remember, much of this pre-dated the internet and social networking.) In all that time, I was the only person I met who shared my beliefs, and those that would ridicule me were in no short supply. Still, I searched on. It has been a long and lonely struggle, but I have finally made my peace with a Godless Universe, and in doing so, I have met countless people who have come to the same conclusions on their own. I have started this blog for others who are still searching, so that their journey need not be as long and lonely and wrought with persecution as mine. I believe that the survival of our species depends on it. Great and insightful post. I think when it comes to a discussion of narratives, like the one above with Carson, it is important to share our own narrative as well. Your story as a young child is especially moving, and I thank you for sharing it. A couple of quick corrections for your response to Carson, however (and I hope you don’t mind me butting in too much). First, only two of the gospels contain a nativity story (Matthew and Luke), not all four. Also, I think the idea that Jesus guarantees that God will answer everyone’s prayers is debatable and generally rejected by most theologians. I definitely struggled with many of the same issues you have, though I generally came to similar conclusions as Carson, and still consider myself a Christian (despite all the baggage that term carries). I think for any revelatory insight to have any meaning, it would have to be put into human terms. This would essentially entail utilizing myths, poetry, allegory, proverbs, and parables to communicate. If God were to use current scientific language or mathematics (or say, language from 10,000 years in the future), I have no doubt it would be mostly meaningless to the majority of people over the past many hundreds of thousands of years. So, God might use a myth people are familiar with (a creation story, a flood narrative) to communicate instead. In fact, the Jews during the Babylonian exile would have immediately recognized the creation myth as having borrowed elements from their Babylonian captors. And yet, point of the stories are entirely different. Not to mention, the biblical account uses language and structure common to Semitic poetic myths. They would have quickly recognized its poetic value. After all, there are Psalms that contain themes regarding creation, and yet nobody freaks out over them, as even modern readers recognize them as poetry. But I definitely appreciate your story, and I think its a struggle all human beings need to face in their lives. We all have different experiences, different understandings of our cultural history, and different ways of interpreting all of the above. I don’t blame any atheist for being an atheist. And yet, in my own struggle, I have found my faith to be both reasonable and illuminating. There are a number of reasons for this, but I don’t think the comments section is an appropriate venue to air out all my opinions. 🙂 In any case, thank you for sharing your story. Carson …… you should write ….. for the public ….. that is one of the most sane and clear explanations I have been lucky enough to be allowed to partake of …… you touch areas that I have not seen addressed in much of my reading, or if it has been there it went over my head or I was just not ready at the time to see it ….. but I kid you not …….. you should publish …. clear, and plain and simple as is above. I love your definition and explanation of atheism. However why do prefer Humanist over atheist? Is it because of morality reasons or purposed? I too must admit, losing sleep over the issues of religion, God and the bible. I think about it constantly and do most of my blogging late at night, cause either I can’t sleep or I wait til my wife is asleep. Hey Biblereader, thank you so much for reading my blog. I’m really glad you found it enjoyable. I apologize for taking so long to get back with you. I had to take a break from the blog for a while, but I just published a new post and it feels good to be writing again. Categories are tricky. I chose Humanist because it says many things about me (that I don’t believe in the supernatural, that I do believe in humanity’s potential, that I value ethics, logic and reason), while the term atheist just says one thing–that I don’t believe in God. I’m certainly not ashamed of being an atheist, but Humanism says a lot more. There is also a negative connotation surrounding the term atheist, and I hope that the term Humanist helps people realize that you can be an atheist and still have values, meaning, and hope. Best of luck to you in your search, my friend. Try not to loose too much sleep. The answers will still be there in the morning. interesting to read your story . I can see you do not believe in God . Assuming God is a person like you and me may be the problem. another concept is what human beings have called God is an attempt to explain how the universe works. That there’s a way in which this universe works e.g gravity, weather, natural forces in geology etc and that that law is what we created a concept of God out of. that said I’m not big on evolution, even that evolution of the eye story did not do much explain development but explain the different kinds of optical receptors .my question is does the inadequacy of the parents translate to a modification of the genes in the children? That for me is the big question in evolution . For Mr natural selection explains distribution of species but I don’t get how species have mutations directed by biological needs. Hi gitts, and thank you so much for taking the time to read my blog and leave a comment. I agree with you that there are many different interpretations of God. However, Christians claim that God was in fact a person, in the form of Jesus. And in the Bible, which is the source of most of the claims about God, God has many attributes of a “person”, including walking, speaking, making a child, as well as emotions like jealousy, anger, love, etc. In my mind this is easy to understand, because if humans created God, then He would naturally assume the characteristics, both good and bad, of His creators. It is interesting to note that every culture’s own gods match the characteristics of the culture they came from. There is also the notion that God created the natural laws and designed everything in the universe. The problem with your point about your phone, or “the divine watchmaker” argument as it is sometimes called, is that we actually have direct evidence that your phone was designed by actual people, and that evidence can be proven to be factual. There is no such evidence for God. The argument that just because something is complex then it must be designed is simply not true, and it assumes that there is a designer before even asking the question, which is a logical fallacy. Additionally, there is plenty of evidence that life was not intelligently designed. Many biological structures are flawed–like the fact that we breathe and eat through the same hole, creating a constant choking hazard, or the fact that we have an appendix that serves no purpose and frequently creates infections. Or take the fact that photosynthesis and respiration, the two main processes that drive all life on earth, are terribly inefficient and far more complicated than need be. Your question about evolution is a great one, and I shared the same confusion after just learning about it myself. The misunderstanding is in thinking that biological need drives mutation, which is not the case. Mutations in our genes randomly happen all the time through simple errors in copying the DNA in our cells and through environmental factors such as radiation or chemical exposure. These mutations get passed on to offspring. If a particular mutation is beneficial to the organism (like having longer hair in a cold environment) then that organism will be more likely to survive and thus, more likely to have offspring. These offspring will also be more reproductively successful, and so the mutated gene gets passed on to more and more of continuing generations in the population, and so the entire population changes over time. Many of these types of changes over hundreds or thousands of generations eventually lead to the new populations looking a lot different than the original organisms. In some cases, over very long periods of time, the organisms are so different that we classify them as a different animal. That is how a few photoreceptive cells can evolve into a eyeball, and how one species can evolve into another. Here is a link to my other blog post explaining evolution more in depth, and I’ve included some good videos to watch that may help with your study. Thank you again for commenting, and please feel free to follow up with any other questions or comments you have. I had read the other article first hence my comments on it. Oh and my thoughts on parents and offspring were more about Larmack’s than Darwin’s theory of natural selection. Another question is why is their biodiversity in a given environment. Take the grasslands where some postulate human ancestors lived. Grazers are well adapted and live there too. A zebra and Gazelle for instance live similar lifestyles grazing and being preyed upon by carnivores but are separate species. Also the question is why are some carnivores and eat other animals instead of grazing, btw this helps to balance the ecosystem. Also how for instance did snakes, spiders etc develop venom which could be either be neurotoxic or haemotoxic? How did the genes for producing that venom appear? many questions for me. Hence my tendency to design, not by a bearded guy seated somewhere but by a law that set it all in motion… I can’t see it but I didn’t see the big bang either start from a point of infinite mass and zero volume- a whole lot of nothing? :). The big bang theorist says it started from nothing, the religions say God made it all from nothing. Both human attempts to explain how it all began in my opinion. Gitts, thank you again for reading and for your comments. Your point about modern engines is valid, except that again, there is direct evidence that people design engines, and there is direct evidence that evolution is happening, but there is no direct evidence that there is an intelligent designer. Additionally, one has to wonder why a perfect, omnipotent creator who can make universes from scratch would fill it with inefficient design. Now, it may be that there is a God and he is a flawed and imperfect creator, but that is another discussion altogether and not what most people mean when they speak of God or intelligent design. Regarding Lamarck, his ideas have mostly been abandoned in biology by modern research findings, but there is some evidence that some particular characteristics developed during a parent’s lifetime may be passed onto offspring through epigenetics, where the actual DNA sequence doesn’t change, but the processes that turn particular genes on on off are changed over generations. You also had a great question about biodiversity. The reason a particular habitat produces several different species instead of just a bunch of the same animal is because each species is adapting to its environment based on the random mutation of its individual genes. One species may develop a mutated gene for antler growth, for instance, and so that animal’s offspring will have longer antlers like gazelles. Another animal may not ever have that random mutation, like zebras, for example, and so zebras don’t have antlers while gazelles do, even though they evolved in the same habitat. This same process explains why some animals eat meat and some eat plants, and how venoms evolved. You can actually research the history of how these different features evolved, so I won’t repeat that here. My point is that you have excellent questions that actually have excellent known answers that do not point to design at all, but rather directly to evolution. I agree with you that there are natural laws that govern these processes, but I believe these “laws”, which we are still trying to understand, formed naturally with the expansion of the universe, and were not set up by any God. Now, I cannot say with absolute certainty that there is not a God outside the universe who planned it all, but no one can say with any evidence that there is. The burden of proof falls on the person making the claim, and extraordinary claims require extraordinary evidence. Now, as to your comments about the Big Bang. No one saw it, but the evidence (the fact that the universe is expanding, the mapping of the cosmic background radiation, etc) suggests that this is exactly what happened. The theory does NOT say that something came from nothing. It says that the very early universe was pure energy with nearly infinite density and infinitely small size, and when something caused it to expand, particles formed into matter from that energy (E=mc^2). We do not know yet what caused this expansion or what came before the tiny dense ball of energy, but we are trying to figure that out. You are right that both religion and science are ways of looking at and figuring out the world. There are very few religions, however, that actually say that the universe came from nothing as you claimed. The Abrahamic religions, for example, all begin with a god floating over the waters. The Bible does not say where the “waters” or the God came from. Most other religions’ creation stories begin with an animal or animals or a god or gods that have always existed, or their origins are simply not dealt with. Religion is based on cultural myths, while science is based on evidence, and that is why I trust science over religion for explaining the world. However, I wholeheartedly agree with you that our understanding of things will and should change with continued research and new evidence. That, my friend, is the adventure of scientific exploration!